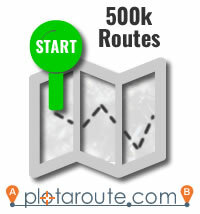 We are very pleased to share with you the news that more than 500,000 routes have now been mapped on plotaroute.com. Many of these routes have been shared on the site, providing inspiration to others in over 200 countries across the world, from the UK, US and Canada, to Antarctica and the Turks and Caicos Islands. People have produced maps for walks, runs and bike rides, but also for more unusual things like Santa sleigh routes, long distance challenges and processions. There have been flat routes and routes that climb some of the highest mountains in the world; short routes and routes that span continents; and routes for every major event distance from 5k to a marathon. If you would like to search through the routes on the site, you can use our route finder to show the location of routes on a map or you can simply browse the full list of shared routes and use the various filters we have to narrow down the list to those of interest. Thank you to everyone who has helped us to get to this fantastic milestone. We are humbled that so many people have chosen plotaroute.com as their online route planner.